Arturo Alonzo Sandoval is a fiber artist whose experimental techniques and expressive interpretations have earned him an international reputation. A Professor of Art at the University of Kentucky Arturo has earned the respect of his students and the admiration of Lexington, his home town, and its art community. Arturo is one of Kentucky's most original, influential and significant artists. Because he creates an extensive collection of work his artwork is everywhere. His work is in the collections of the New York City Museum of Modern Art's Architecture and Design Collection, as well as galleries and private collections throughout the United States and the world. Arturo is frequently featured in national journals, periodicals and books, and the topic of local television last year. 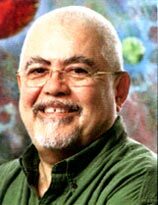 Arturo celebrated twenty five years as an artist and educator with retrospective exhibition throughout Lexington and eight consecutive exhibits the spring of 1998. For further information about Arturo, his artwork or to purchase one of his pieces fill out the feedback form or send an e-mail.